The waterproof speaker they should have made the first time. Anker has made yet another quality bang for your buck speaker. For the price, you can't go wrong. Here at Sound Guys, Anker is 3 for 3 when it comes to their Bluetooth speakers. But their luck has to end eventually, right? The new Anker SoundCore Sport XL is a much larger version of their tiny waterproof speaker the SoundCore Sport. It’s way bigger, way bulkier, and way more durable. So did Anker make another great product, or did they finally miss the target? In the box you’ll get the speaker, a hand strap, micro USB charging cable, and the warranty information and instruction booklet. When Anker decided to make a durable speaker, they really made one. The SoundCore Sport XL is a brick of a speaker with a metal grill on the front and a hard plastic covering the rest of the speaker. It has an industrial look with visible screws holding everything together. Underneath you can just barely see the waterproof fabric that keeps the drivers safe. The speaker has rounded off edges that give it a smooth feel in the hand. But the interesting design choices become apparent when you look at the back. When you flip it around, you’ll see that there are a few squared off sections on the back of the speaker. The confusing part is that only two of them are useful. The middle section is where the passive bass radiator is and underneath that which is great to watch when you’re playing music. Keeping the speaker safe from water and dust is a discrete flap that houses the aux input, micro USB input, and USB output. This flap is one of the main reasons why the Sport XL was able to receive it’s IP67 waterproof certification. It’s snaps on securely but you can peel it back relatively easily. Up top you’ll find five buttons. From left to right the buttons control the power, volume down, pause/play, volume up, and Bluetooth pairing. On the upper right hand edge are four small indicator lights, one of which tells you when the speaker is in pairing mode. You won’t be left guessing how much battery life remains thanks to the other three indicator lights. There’s also a small metal bar that you can attach the included wrist strap to so you can carry it around or hang it from places. The speaker is hefty and has a solid build. You’ll notice that the speaker is pretty hefty and has a solid build. The buttons are nice and clicky, and the bass radiator is awesome to look at. While the wrist strap is definitely helpful, the speaker isn’t exactly light. I was surprised at how dense it was compared to its size. Though it is easily durable enough for the yard or a trip to the beach, I can’t see this being use on a hiking trip for example. Sure it’s solid, but it’s also heavy enough that I can see it becoming a burden to the person carrying it. As far as connection goes Anker claims this speaker has a range of 66 feet, and though it’s true I wouldn’t recommend relying on it for consistent playback. The connection was definitely strong enough even at about 40 feet with a wall in the way. Playback was smooth and enjoyable. At 50-60 feet playback was sputtering around once every 20 seconds which is still impressive. But it just isn’t consistent enough to use regularly at that range. As far as playback goes, you can easily control volume and pause/play music. Double tapping the play button will let you skip to the next track if you do it quick enough, but you won’t be able to return to a previous track or fast forward through songs. 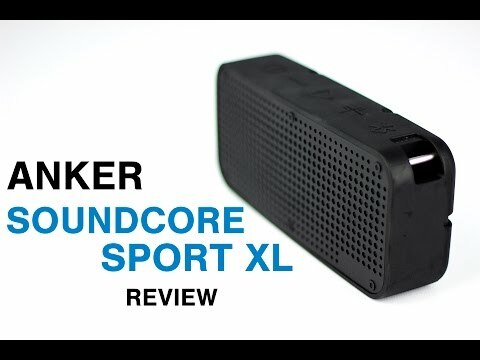 Anker claims that the SoundCore Sport XL will get you around 15 hours of constant playback, but does specify that it depends on the volume and audio content. Still, playing songs at max volume I was still able to squeeze 15 hours out of this speaker. Right on the money. Though it’s worth keeping in mind that the battery life will decrease if you decide to use the USB output to charge your devices. We were pretty impressed by the original SoundCore mainly because it optimized its sound-to-size ratio. So with the larger size of the SoundCore Sport XL we were expecting a bigger sound, and we were right. That larger sound starts with the bass. The Sport XL has an exposed bass radiator on the back that, along with the larger overall size, helps to make the low end sound nice and full. I really enjoyed how tightly controlled bass kicks and bass guitars were. Regardless of the song, they coexisted nicely throughout the lows. A good example of this is in the song “Hunter” by Pharrell Williams, where the bass guitar and thumping kicks weave in and out seamlessly. The only downside I can think of is that the bass is a little on the strong side. But if you’re getting a durable Bluetooth speaker you’re probably not too concerned with audiophile accuracy. One thing I noticed was that the mids are very focused on vocals. Obviously that’s good for vocals, but in my testing other elements don’t get to shine enough. There’s also definitely a slight “snap” in the upper-mids that accompanies snares. It’s really only noticeable/irritating if you’re really close to the speaker. Soundstage in the mids isn’t as impressive as it was with the lows. In most songs background instruments don’t seem to have too much space between them. Still, if you listen to vocal music you’re going to really enjoy the sound quality of this speaker. Highs were mostly decent, but more often than not there was aspect of a song that became somewhat piercing. Cymbals and hi-hats sounded nice and airy as long as you’re in front of the speaker. If you’re slightly off to the side you can still hear the decay but the actual hit becomes harder to distinguish. I noticed this first in the song “Stole My Heart” by Little & Ashley, since they have hi-hats prominently played throughout the song. With a 15-hour playback time, you can use the Anker SoundCore Sport XL all day. Plus, you can charge your phone or tablet with it. The back of the Anker SoundCore Sport XL is rubberized. Its IP67 rating makes it dust and shock-resistant and waterproof for one meter. On the top panel of the are all playback controls and a metal bar to wrap a cord around for security. Since it’s waterproof, the playback controls are a bit mushy, but it’s at the benefit of durability. If you can’t already tell, Anker has done it again. At $200, this speaker would be a hard pass. But at only $59, it’s yet another must have from the company. There are only a few really good waterproof speakers at this price point like the CB3 Armor XL or the Sharkk 2o, and now you can add the SoundCore Sport XL to that list. Sure it’s really heavy and bulky, the sound quality isn’t as good as we’ve seen from Anker, and battery life is just average, but it’s only $59.